Here we are again, in the season of Epiphany, on Baptism of the Lord Sunday. Each year the lectionary gives us the story of Jesus’ baptism, as told by Matthew, Mark, or Luke. This year, it’s Luke. Most of the third chapter of Luke follows the story of John's ministry as told by Matthew and Mark. John is the voice crying in the wilderness… John baptizes hundreds who came out to be baptized. We hear John making it clear that he isn't the Messiah: "I baptize you with water," he said, "but one who is more powerful than I is coming. I am not worthy to untie the thong of his sandals. 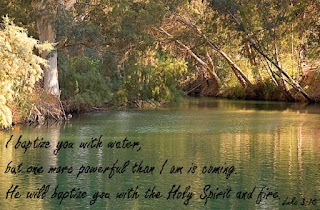 He will baptize you with the Holy Spirit and fire." But then Luke adds a little interlude about Herod being very angry with John, because John had charged him with stealing his brother's wife. Indeed, Luke tells us Herod was so upset that he shut John up in prison. The lectionary wants to omit these verses. They interrupt the narrative we’re used to hearing, and they complicate how we interpret the story of Jesus’ baptism. But I think Luke included the verses for a reason. After the little interlude about Herod throwing John into prison, the story goes on. "Now, when all the people were baptized, and when Jesus also had been baptized. But how could John baptize Jesus if John was in prison? Or is Luke simply writing about something that had already happened before Herod imprisoned John? If we pay close attention, we might notice that Luke doesn’t say anything about Jesus' baptism. There's nothing here about Jesus going down into the water or coming up out of the water. We probably assume that this happened as the other gospels tell the story, but Luke doesn't seem to be very interested in the actual moment of baptism-- but only what happened after baptism. What Luke seems to be more interested in is that Jesus was praying when the Holy Spirit descended on him in bodily form like a dove. There’s another difference in the way Luke tells the story. In the different accounts, we hear John saying, “I baptize you with water, but one who is more powerful than I is coming.” But Luke goes on to say, “He will baptize you with the Holy Spirit and fire. His winnowing fork is in his hand, to clear his threshing floor and to gather the wheat into his granary. But the chaff he will burn with unquenchable fire. Now, I know some people’s minds connect the “fire” John talks about to the fires of hell, but that’s not what this is about. Generally, “fire” in the Bible isn’t about punishment, but about purification. This imagery is about Jesus separating the good grain in our lives from the chaff—which is the husk part that is often thrown away-- and how the chaff would be burned away. Luke tells us that, when Jesus was baptized, the spirit in the form of a dove came upon him. As Adam Ericksen points out, the symbol of the Roman Empire was a fierce eagle—a bird of prey. The early Christians had a different symbol: a peaceful dove. Luke pictures John the Baptist as an end-time prophet who announced that the world was about to change, that the realm of God was being ushered in—a new world in which all things would live together in love, peace, justice, mutual support, freedom, and dignity. When John called people to repent and be baptized, he was calling them to turn away from complicity with the old age and its values and behaviors and to turn toward the coming realm. John announced that the one who was coming would be more powerful, and would bring in the new kingdom and leave the Holy Spirit to empower the community to continue to witness to the realm. Baptism teaches us who we are – God’s beloved children. It reminds us of the promise: God loves us unconditionally. Baptism reminds us that we discover who we are in relation to whose we are: God’s beloved children. We belong to God’s family, and baptism is a tangible sign of that. Baptism is about knowing who we are, so we don’t waste precious time searching frantically for an identity that something or someone else can confer on us-- but instead, use our lives to live out our God-given, baptism-shaped identity. The same Spirit that descended on Jesus baptizes us! We can live in confidence that-- no matter how often we fall short or fail-- nothing that we do or fail to do can change the fact that we are God’s beloved children. This identity is something God gives us—as a gift. There’s something else we need to remember: at our baptism, God gave each of us the gift of the Spirit. So, let’s turn to one another and remind one another: You’ve got the Spirit, because God gave it to you when you were baptized. Without the rest of Jesus’ life, his baptism isn’t something we can comprehend. We can only comprehend the purpose of Jesus’ baptism when we look at the days and years that followed that day in the Jordan. It’s when we see Jesus taking his place with hurting people that his baptism starts to make sense. Jesus’ baptism in the Jordan foreshadowed his baptism on the cross. Baptism was Jesus’ commissioning for ministry. Jesus answers by referring to his baptism: “Was the baptism of John from heaven-- or not?” In other words, I was baptized. That’s how all this started.” It was in the waters of baptism that Jesus heard the Spirit calling him to speak the truth and to live with grace. In baptism, God proclaims God's grace and love for us. God claims us and marks us as God’s own. We have a new identity as members of the body of Christ. So, we are baptized and begin a lifelong journey with God... a lifelong process of conversion and nurture that begins at the font and doesn't end until death, until we are at last tucked safely into the everlasting arms of the God who first reached for us in baptism. God keeps on reaching out for us throughout our lives. God isn't finished with any of us yet. Every day we live out our baptism. Every day we need to respond to God's gracious gifts in our lives... open ourselves again to God's work in our lives... say yes in all the big and little things we do and people we meet and promises we keep throughout the day. A major part of God's daily saving work in our lives is God's gift of the Holy Spirit. Just as God's creating Spirit hovered over the waters in the very beginning, the Holy Spirit works in us...leads us daily...tugging at our lives until we are more fully turned toward God. In our baptism, we become part of a royal priesthood, a holy nation, in order that we may proclaim the mighty acts of the One who called us out of darkness, into God's marvelous light. In our Reformed part of the Protestant branch of Christ’s church, we take our membership in the priesthood of all believers very seriously. In fact, in the Presbyterian Church, we take this calling so seriously that we ordain our officers for service. The questions we ask at a service of ordination and installation of elders and deacons-- the questions you'll hear in a few minutes-- are the same questions asked of a Minister of the Word and Sacrament, except one. The congregation makes promises too: to support and encourage and pray for those who are serving as officers. Every one of us gathered here has been given a particular set of gifts to use in God's service. This community of believers is part of God's plan to bring good news of healing and freedom to a broken, hurting world. On this Baptism of the Lord Sunday, we are reminded of Jesus' baptism and our own. We are reminded who we are... and whose we are. At your baptism, the same Spirit came down upon you as came down upon Jesus at his baptism. The same Father said to you, "you are my beloved son"... or "you are my beloved daughter." The same Father has continued ever since to hold you... and to work to empower you for God's work. How easy it is, in the midst of this life, to forget who you are... and whose you are. So, the church is here to remind you that God has named us... and claimed us... and seeks us and loves us unconditionally. This is the gift Baptism gives to us. We are children of God, joined together with Christ to all the other Children of God. So, remember your baptism and be thankful. For this is who we are. Listen attentively for God’s call. Use the gifts God has given you as a sign of the outbreaking of the kingdom of God. Take on new challenges in your ministry. Rely on the Holy Spirit to lead and empower and uphold you. As you go out into the world, be the minister that God has called you to be.